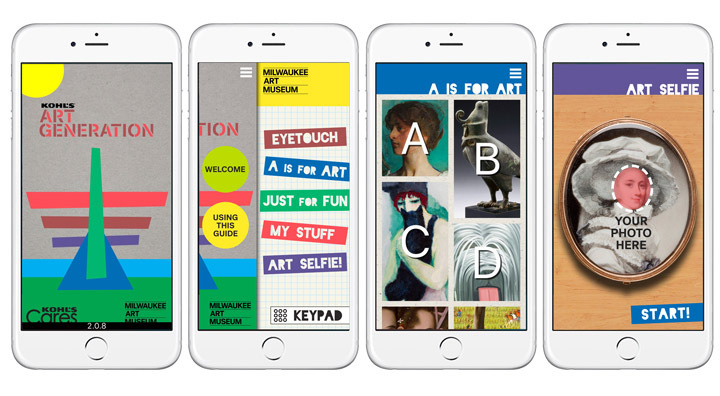 The new app for the Milwaukee Art Museum is uniquely segmented for two groups of young visitors – ages 3-7 and 8-12. It was playfully designed to engage kids, providing fun ways to experience the Museum, and inspire them to explore the content and collections. 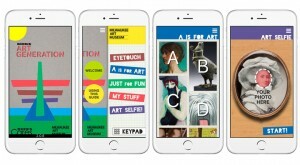 A is for Art – The first museum app developed specifically for very young audiences (3-7) immediately engages kids in the ABC’s of what they are seeing in the artworks, starting with “A is for Angel” at Abbott Thayer’s An Angel (1893) and ending with “Z is for Zoo” at Giovanni Castiglione’s Noah and the Animals Entering the Ark, (ca. 1650). The app features short audio excerpts that encourage discussion between the child listeners and their adult. Its also charmingly voiced by child actors. Eye-Touch – For children aged 8-12, this component of the app uses a mix of audio, video and interactive games to introduce kids to more than 40 works in the collection. The tour balances fun experiences – such as behind-the-scenes video footage of artists at work and on-screen activities, with audio-messages aimed at helping kids to look closely and engage with the art. As an example, children can see a spoof weather report from a local meteorologist based on a painting they’re observing – or participate in games where they pick and mix together the sound effects. Art Selfie – A fun camera function to encourage kids (and adults!) to connect directly with the art they are looking at, and in turn, be creative themselves. Using the camera, kids take a Selfie and insert themselves into a selection of art works, then share the resulting image on social media or save them on their device. This feature uses the Museum’s collection of anonymous 18th and 19th century portrait miniatures to give visitors a chance to see how they would look as a work of art. Since visitors already love to use their cameras in museums and the Art Selfie is a great way to turn that behavior into a creative and fun experience. Instead of saying ‘no’ to phones and cameras, this brings visitors right into experience. Launched on MuseumSelfieDay and coinciding with the reopening of the museum, the app had over 2,000 downloads the very first weekend!